Technology is ushering in a new age of automation. Every day, across industries, smarter machines are deployed to manage the growing scale of work. With computer technology eliminating some tasks and lowering the demand for human labour, man has been able to perform tasks better and at a more rapid rate by sharing the labour with machines. These youth are taking robots and artificial intelligence to the next level. Making impressive strides in the innovative sector, the young guys and girls worked together as a team to develop machines as a means of finding solutions to some global issues. 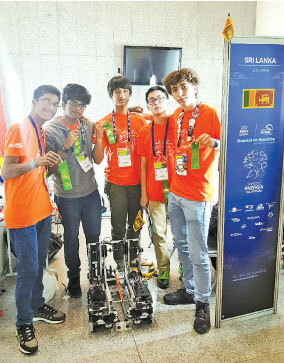 The event, titled ‘First Global Challenge (FGC) 2018’ saw over 150 teams from all parts of the world gathering together under one roof at the Arena Ciudad de Mexico in Mexico City, Mexico, to take part in the annual international robotics competition. Considered as the robotics Olympics and held from August 15 to 18, FGC focuses on fostering, understanding and cooperation among youth as they use their skills to resolve problems which have emerged in the modern society. This year’s competition was themed ‘Energy Impact’. Teams competed to fuel power plants, initiate renewable energy plants and build a resilient transmission network. The Sri Lankan team comprised of eight youth: Lasith Kodagoda and Navod Vitharanage from President’s College, Embilipitiya, Sherwin Leonard from St John’s College, Jaffna, and Dao Thanh Cong, Felix Deemer, Daniel Joung, Hamza Anver and Syanthan Selvakumaran from Elizabeth Moir School, Colombo. 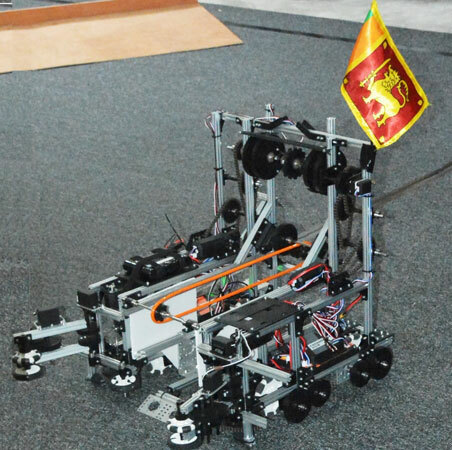 The team designed a robot which is able to perform simple tasks like picking up boxes, storing them, transporting them to a specific location and lifting them up to a specific height. It was also designed to carry solar panels and to drop them off. “What was special about our robot was our lift mechanism. 193 countries took part in the event and they used only four types of mechanisms to lift boxes. Ours was one of a kind of product. All the other country did not use this kind of mechanism. So our product stood out among them because of this,” Daniel explained. The team has worked tirelessly for four months developing the machine. They have been guided by the teachers in charge Satchithananthan, Rathnasinghe, Fernando and Aruliah. She added that being able to secure the necessary funds is an important aspect. If participants are unable to finance themselves, then funding needs to be found for them. “We were lucky to have generous sponsors who were willing to step in and provide the additional support needed to send the team to Mexico this year,” she said. Felix echoes the words of Dean Kamen, inventor and founder of the First Global Challenge when he says that robotics is all about problem solving, about solving the real, concrete challenges that the world faces today, whether its global warming or producing enough energy. “Kamen talked about the effort people put into sport, and how he is trying to turn robotics into a sport so that more people will be interested in it, and there will be a whole generation of people who are really good at robotics, really good at coding and really good at solving problems. Anyone in any country should have the opportunity to do robotics and coding because it is so interesting and useful,” he opined. Navod too has always been interested in robotics from childhood. He believes that every student should be given the opportunity to study it. Sherwin said that he has a lot of interests from technology and science to music and sports. “However robotics is my most important passion. I want to be a Mechatronics Engineer. I won second place for my invention at the SLAAS competition. My goal is to help future generations learn more about robotics and achieve more in that field, particularly in terms of Artificial Intelligence,” he expressed. “It was a great opportunity to improve my abilities in robotics. My parents and friends too backed me and were very proud of our achievement,” he added. The language barrier has been a minor problem for the team during the first few days the team began work. 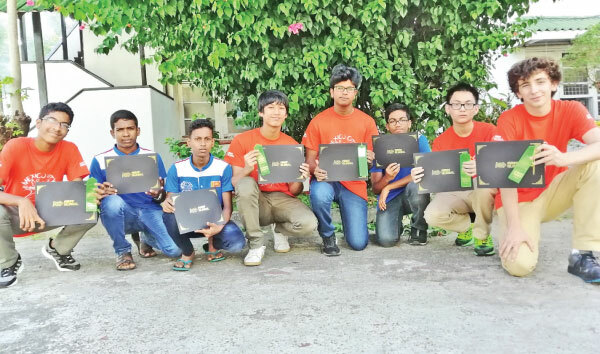 Syanthan says that it turned out to be beneficial as the team members came up with different ideas and solutions because they came from diverse backgrounds and cultures. The team says that the highlight of the whole event was the game in which they scored one of the highest points ever to be scored in the tournament. “It was a really fantastic experience! We were partnered with Jamaica and South Africa and the synergy between us really helped win us that game,” Syanthan enthused. Daniel adds that he and the South African captain strategized for a long time before the game. “That really helped. Another highlight was winning a judges’ award, on the technical side, for our robot’s unique design and efficiency,” he explained. Sherwin adds that he managed to make friends with a lot of other participants from various nations. “This was my first time at an international competition and I really enjoyed the experience,” he said. Daniel says that every robot which had been exhibited at FGC 2018 was unique in its own way. “It was interesting to see so many different solutions for the same problem,” he noted. “I would definitely encourage other students to take part in FGC. It was such an amazing experience not only because of learning more about robotics but also because you get to meet people from all these different countries, get to see their ideas and talk with them. For anyone with potential in this area, take any action. You can to pursue your interest. Take whatever opportunities you may get to participate in robotics and coding related events and competitions,” Felix advised. “Being part of team Sri Lanka gave me a chance to contribute to something that showcased our country and our abilities. Everyone else with potential in robotics and coding should try to find and take opportunities like this one,” was Navod’s message to other youth.